HTC An-Chan Giveaway from HTC Malaysia: An-Chan's Kids get Jelly Bean! 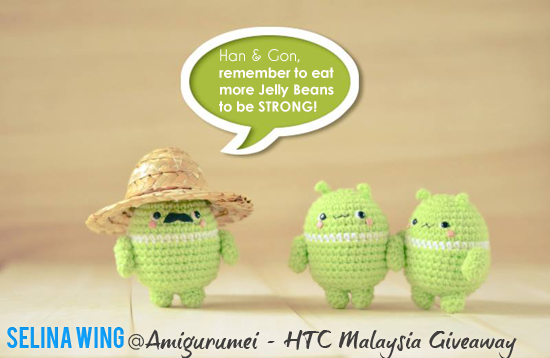 I love the cute giveaway by Amigurumei for the fans at HTC Malaysia Facebook! I like to take part in this giveaway contest because I attracted to An-Chan and his kids! :D It make me think the creative idea. I decided to use the Hansel & Gretel Story because two kids resemble Hansel and Gretel! So, I give the names for An-Chan's kids; Han & Gan. They need to be strong and healthy as they needed the latest of Android, Jelly Bean! That is why their father always advise them! I also like to wish my dad, Happy Father's Day! He always take care of me so very well. He always feed me to eat alot to be healthy girl! But, I felt that my weight be increased already... :P Haha. I have an interesting new from HTC Malaysia for you! You should check new HTC ONE! I fell love on this! You can explore more if you interested with this smartphone, visit their website: Gallery of Feature Tour, HTC One. My wish is getting my first smartphone, HTC ONE for my birthday!